Python is a high-level, interpreted, interactive and object-oriented scripting language. Python is designed to be highly readable. It uses English keywords frequently whereas the other languages use punctuations. It has fewer syntactical constructions than other languages. Python is Interpreted:- Python is processed at runtime by the interpreter. You do not need to compile your program before executing it. This is similar to PERL and PHP. Python is Interactive:- You can actually sit at a Python prompt and interact with the interpreter directly to write your programs. Python is Object-Oriented:- Python supports Object-Oriented style or technique of programming that encapsulates code within objects. Python is a Beginner's Language:- Python is a great language for the beginner-level programmers and supports the development of a wide range of applications from simple text processing to WWW browsers to games. A Brief History of Python Programming language. Python 1.0 was released in November 1994. In 2000, Python 2.0 was released. Python 2.7.11 is the latest edition of Python 2. Meanwhile, Python 3.0 was released in 2008. 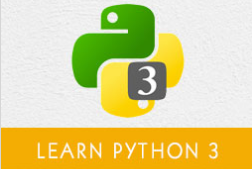 Python 3 is not backward compatible with Python 2. The emphasis in Python 3 had been on the removal of duplicate programming constructs and modules so that "There should be one -- and preferably only one -- obvious way to do it." Python 3.5.1 is the latest version of Python 3. Easy-to-learn :- Python has few keywords, simple structure, and a clearly defined syntax. This allows a student to pick up the language quickly. Easy-to-read:- Python code is more clearly defined and visible to the eyes. Easy-to-maintain:- Python's source code is fairly easy-to-maintain. A broad standard library:- Python's bulk of the library is very portable and cross-platform compatible on UNIX, Windows, and Macintosh. Interactive Mode:- Python has support for an interactive mode which allows interactive testing and debugging of snippets of code. Portable:- Python can run on a wide variety of hardware platforms and has the same interface on all platforms. Extendable:- You can add low-level modules to the Python interpreter. These modules enable programmers to add to or customize their tools to be more efficient. Databases:- Python provides interfaces to all major commercial databases. GUI Programming:- Python supports GUI applications that can be created and ported to many system calls, libraries and windows systems, such as Windows MFC, Macintosh, and the X Window system of Unix. Scalable:- Python provides a better structure and support for large programs than shell scripting.